A few years ago, "The Real Deal" participated in a reality TV show called "The Search". Although we were the smallest team with the smallest budget, we still managed to come in 2nd place, and due to our "extreme professionalism" we were asked to produce our very own full season TV show. As we enter our 6th year of filming, we still carry the same values we started with in the very beginning. We produce a real life TV show without any staged scenes, creating a show with high standards and a show that the public can relate to. Our experienced team will continue to showcase a variety of outdoor activities from across North America including trapping, fishing, outfitted hunts as well as private personal hunts. The Real Deal team takes great pride in capturing real life hunts, just as they happen. We really are the guys and girls next door. We work hard, and play hard, and we share our adventures with our viewers exactly as they unfold. 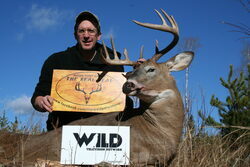 Marc McNay (founder of The Real Deal) grew up hunting the wilds of Northwestern Ontario. With his new found enthusiasm of videoing hunts, Marc has expanded not only his passion for the hunt, but also his hunting area. 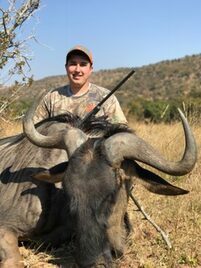 Although Marc does not consider himself to be a trophy hunter, he has managed to acquire some fine trophies while filling his freezer at the same time. Marc has a growing arsenal of camera gear to assist in his passion for filming. Top this off with running a successful outdoors business plus doing a bit of guiding, leaves Marc chasing his dreams and wildlife for a large part of the year. Whether it be still shots or video, Amber Fecho has always enjoyed being behind a camera. With a natural eye for capturing the moment, it has become a rewarding experience to have a purpose as Camera Girl Amber. Amber is an animal lover and has done some wild rescue work. She is brand new to hunting and with her love for animals and food, she strives to humanely harvest animals that have lived free and natural lives. With great organizational and computer skills, Amber also assists Marc as his assistant and website designer. Keevin Erickson is the youngest member of The Real Deal Team. 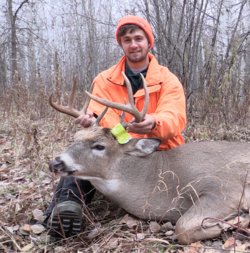 From Lundar Manitoba, Keevin loves hunting and has been filming his hunts for the past 9 years. 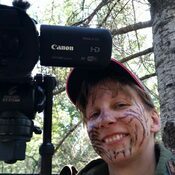 Currently taking Environmental Sciences at the University of Manitoba, Keevin still makes time for hunting a variety of species including bear, elk, whitetail, waterfowl, coyote, wolves, and caribou. The majority of his hunting is archery, but he occasionally uses muzzleloader and rifle. Keeving operates the Instagram Page @HuntingTheInterlake which it is the largest outdoor page in Canada with over 350,000 current followers. The Saskatchewan father and son duo can be found in the family run business of one of the largest trapping supply stores in Canada, Dam Beaver Trapping Supplies. If not selling traps, then you can find them trapping, hunting and fishing the Parkland area of the province, and even as far away as Africa! Ian grew up trapping muskrat and beaver on the family farm with his dad. He has taken that knowledge and passed it down to Calin …carrying on tradition, and today they trap and snare the farmland. Calin’s love for trapping and filming go hand in hand as he aims not just to film for enjoyment, but also to help educate young trappers. Braydon Kreger is from the Rainy River district in Ontario. He is new to the filming industry, but has had great success with a camera in the early stages of his career. Braydon is very passionate about what he does and has been successful in previous years. He spends most of his time outdoors fishing and hunting. 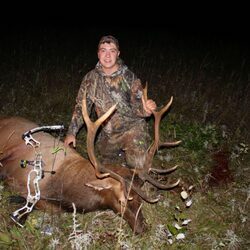 His favourite animal to target is definitely whitetail deer as he spends the majority of his late summers and falls prepping for the season to come. Although Braydon has not had much experience hunting much else he is always up to the challenge and willing to put the work in.